I wrote with tears and anguish, pouring into the pages all the pain that life had meant to me. I think that this quote sums up the book for this is how I felt as I read this book. It was quite sad and incredibly moving. It has been a long time since a book moved me enough to actually cry. I cried not only because of the obvious reasons of the pain and suffering that these characters went through but also because it was so thought-provoking. In a very real way, it describes the unfairness of life and the sheer struggles of poverty. It is also gruesome and horrifying in many ways as well. I realize that it is most likely considered sensationalized like an example of a "muckraking" novel since Sinclair was known as a socialist journalist, but it still captivated me. I couldn't help but read what he had written. 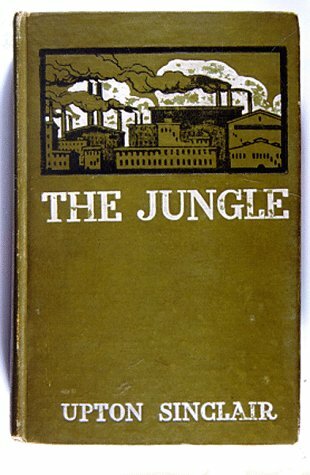 The novel was first published in serial form in 1905. "After five rejections", its first edition as a novel was published by Doubleday, Page & Company on February 28, 1906, and it became an immediate bestseller. It has been in print ever since. The novel follows the life of Jurgis Rudkus who with his family, Ona, Elzbieta and her children, Marija and Jonas immigrates to the U.S. and in order to provide for his family he starts right off working in Chicago's meat packing plants. At first he is a young and capable hard worker but as he continues his menial job in the meat packing plants he learns and sees things that he wouldn't ever want to know of. The stress of the long working days and what he experiences wear on him but he continues for the good of his family. His options are very limited and a language barrier also proves to be very difficult in his ability to express himself which leads to a fear of being cheated and more frustration of not understanding all that he feels he should be able to. He continues to work hard in order to overcome these barriers in order to find a way to survive. All of this leads to a combination of decisions that the family desperately try to make together but in the end leads to more trouble for all of them. I understand that Sinclair was hoping to promote socialism, which is quite evident in the latter part of the book, and necessary help for the poor but I am glad for today that change was brought about for the food industry, owed in part perhaps to this book for the meat packing industry, and that we now have an FDA. Overall, this is a compelling read and a definitive classic. Sinclair showed the power that one man writing a book can have to change a nation. It is a rare accomplishment, and it makes The Jungle a testimony to the power of the written word to transcend far beyond and change the very fabric of a society. Thanks for bringing all your good comments to the book club. I totally cheated that day. As Ivy would say, "ZERO!" Thanks, Amanda. I really hoped that it went alright. I was a bit worried about it. I think you always do a great job with the book club, btw. I do hope Ivy is doing alright. Thanks for always reading my book reviews.